Our adventures began early on the morning of the 22nd, when we had to find a way to be at Narita airport before our 6:30 AM flight. However, Jess wasn’t able to leave Koga until after 9:00, long after the last train we could have taken to the airport would leave. After a few days of asking each other, “What are we going to do?” and groaning over the though of having to take a taxi for even a portion of the journey to the airport, Lauren was awesome enough to step up to the plate and drive us there. We didn’t get to the airport until around 1:30 AM, and what awaited us there was something we didn’t expect. Airports in the United States tend to be open 24/7 (or so I’ve experienced in all of the airports I’ve been to), but Narita Airport closes down at night, and doesn’t reopen until around 5:00 AM. So, when our car entered the airport grounds, we were greeted by a security guard who checked everyone’s identification and confirmed with Jess and I that we had the first flight out before waving the car through the barrier. Inside the airport, we went through a similar procedure with another guard next to the doors before we were guided to a set of benches where we were supposed to sleep until the airport officially opened. Let me say this, it was strange sleeping under the watchful eye of the numerous security guards that roamed the corridors but it also felt pretty safe. Only the sneakiest of cat burglars could rifle through a sleeping person’s bag with several security guards in the vicinity! We slept until 3:30, when the lights turned back on, and our gate opened at 4:30. After that it wasn’t long until we were on our flight to Hokkaido. We landed after a little less than ninety minutes and once we had our luggage we went to meet Amanda, whose English school we would be staying at for a few days. She guided us there, gave a quick tour, answered any questions we had, and then headed off to the ski slopes with the promise to meet us later for dinner. The next few days were a whirlwind of exploring Sapporo and all it had to offer. We went to Hitsujigaoka Lookout Point, hiked in the Art Park, purchased items at a Christmas market in Odori Park, visited Sapporo’s famous chocolate factory (but didn’t take any of the offered tours — perhaps next time!). On Christmas Eve, however, we had a very leisurely morning, but then treated ourselves by going to see The Hobbit. As an avid Tolkien fan, I have to say that this had to be one of the best Christmas presents I could ever give myself. We then had dinner at the Christmas market, and immersed once more in the Christmas items and foods that Russian, German, and other immigrants had to offer. We bought two bags of roasted almonds (cinnamon and cherry) and headed back to where we were staying. 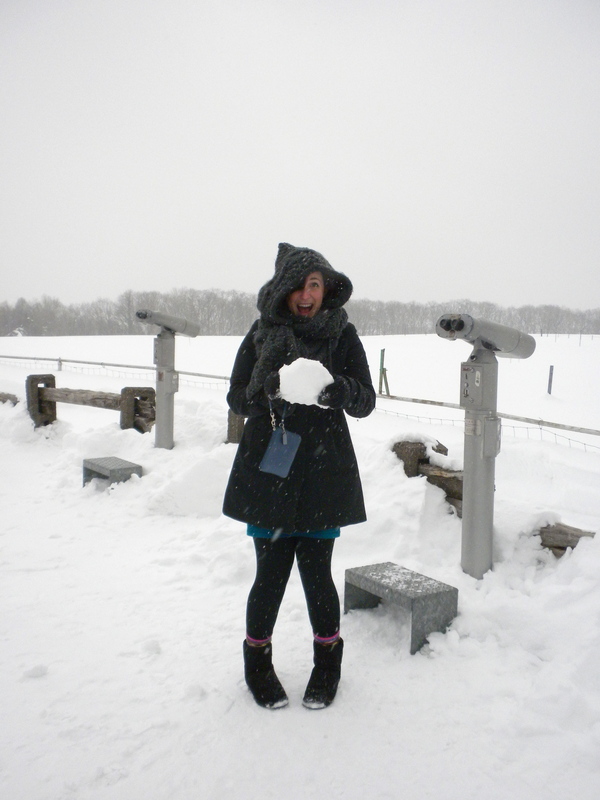 Jess reunited with snow at Hitsujigaoka. 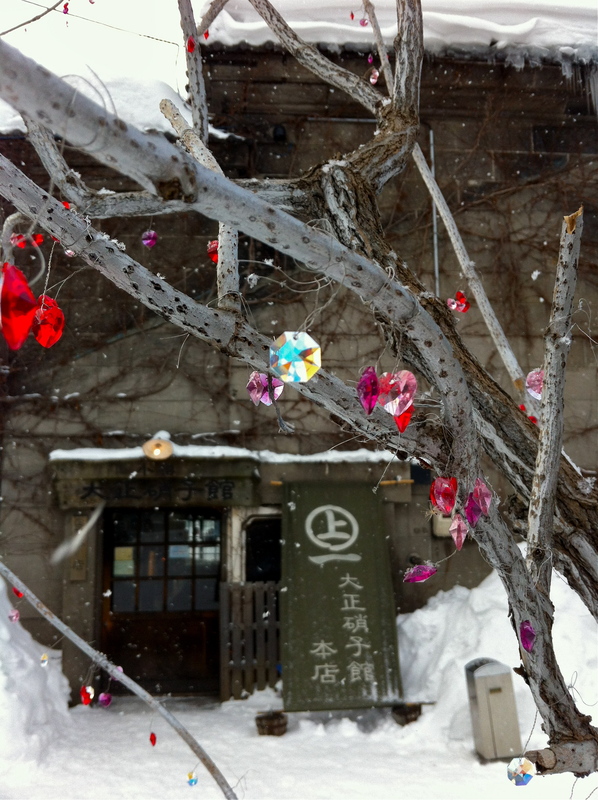 On the 25th, we took a day trip to the city of Otaru, which is famous for its seafood and glass. After a beautiful 40 minute train ride along the coast, we walked to an area filled with glass shops, all attributed to the same company. We spent hours going through all of the shops, and a few small trinkets ended up coming home with us. We also got a chance to make some of our own glass! We were able to make marbled glass beads, which required two colors of glass and a really patient instructor to coach us through melting everything onto a turning stick. Afterward, we were able to purchase an item to attach our bead to (if we wanted to), so we both decided to make bookmarks. Crystals outside of the main shop. That evening we separately Skyped our families, while eating breakfast. No, you didn’t read that wrong. We thought it would be fun to eat Christmas breakfast with our families, so we ate pancakes, sausage, and eggs at 10 PM while talking with people sitting through their Christmas morning. We hit a bit of a snag when we discovered that the apartment didn’t have a stove, but a microwave works wonders. Did you know that you can make pancakes and some decent scrambled eggs using a microwave? I sure didn’t! 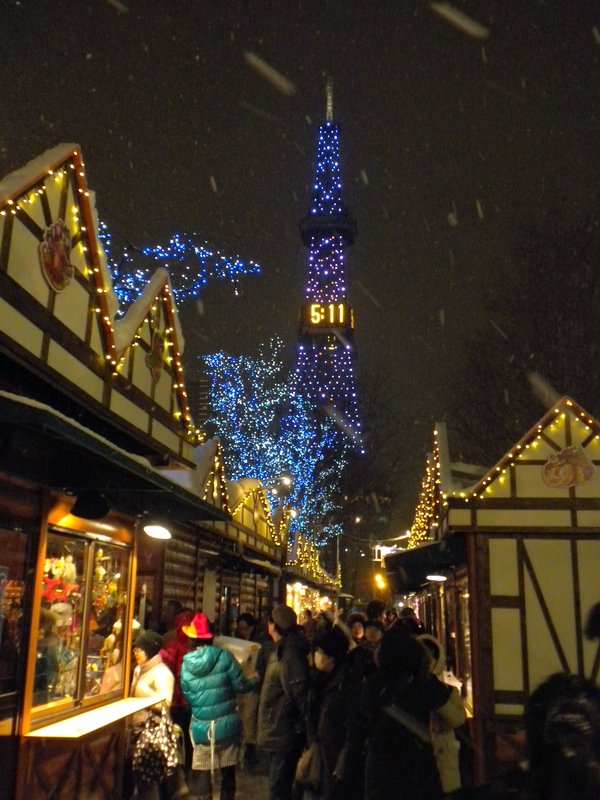 Christmas in Hokkaido was a wonderful experience, and the memories made then will stay with me forever. There’s nothing like a gently falling snow while you’re outside eating your dinner in the middle of a bustling Christmas market in Japan, that’s for sure. While there were moments where I did start feeling homesick, and worried that someone else was sitting in MY chair at Grandma’s house, I wouldn’t go back and change this year’s Christmas for anything.